The long-standing company of Fearnely and Eger goes back to 1869 and was primarily involved in the tramp trade venturing into liner operations across the Atlantic and into the Pacific before the First World War. Between the wars the company continued to add to its fleet but lost nine ships during the Second World War. Post war, Fearnley and Eger continued to thrive and went on to add bulk carriers and tankers to their substantial fleet. In 1972 the company began to diversify into different directions and in addition to their cargo and tanker ships took on partnerships relating to cruises ships, ferries as well as the oil business with supply ships and oil rigs. In 1989 Renaissance Cruises was founded, the company building eight yacht like vessels aimed at the luxury market. It was believed that initially, Fearnley and Eger intended chartering the ships out, taking advantage of the large building subsidies available at the time from the Italian Government. The company however established a headquarters in Fort Lauderdale from where the vessels were marketed. Originally eight Renaissance Class, vessels, were operated. The first ship was named Renaissance followed by Renaissance 2 through to Renaissance 8. They were small, intimate ships aimed at the luxury market and all were completed between 1989 and 1992. The first four were built in Cantieri Navale Ferrari-Signani shipyards in La Specia and were 4,077gt with a length of 88.3m, and a beam of 15.3m. Two MAN-B & W 12V28 diesel engines gave them a speed of 15 knots. The second batch of four ships was slightly larger at 4,200gt, had a length of 90.6m and a beam of 15.3m. Again, twin B & W diesel engines were installed giving a speed of 16 knots. Renaissance 5 to 8 was built in Nuovi Cantieri Apuania shipyard in Carrara, Italy. The first quartet carried 100 passengers, whilst the second group carried 114 in twin cabins. Yard Number 43, entered service in 1989. Two years later she was chartered to Universal Cruise Lines of Singapore and subsequently renamed The Mercury. The vessel was laid up when Universal went bankrupt in 2002 and she then passed to Viking Lines, Malaysia, who continued to lay the vessel up until sold in 2004. The ship was used as a floating casino between Singapore and Malaysia as Leisure World I. 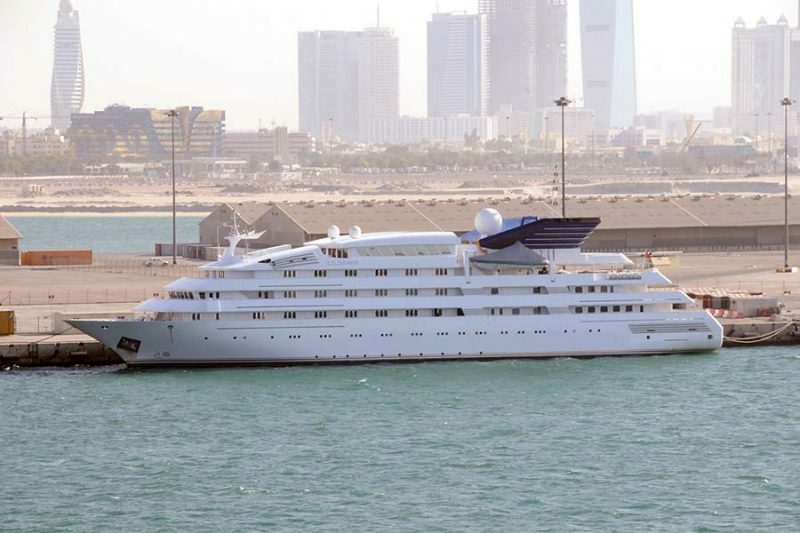 In March 2007 she was sold to the Dubai based Platinum Yacht Management, and is currently used as a yacht under the name of Dubawi (above). Yard Number 44 and entered service in 1990, remaining with the company until the larger R Class ships entered service. 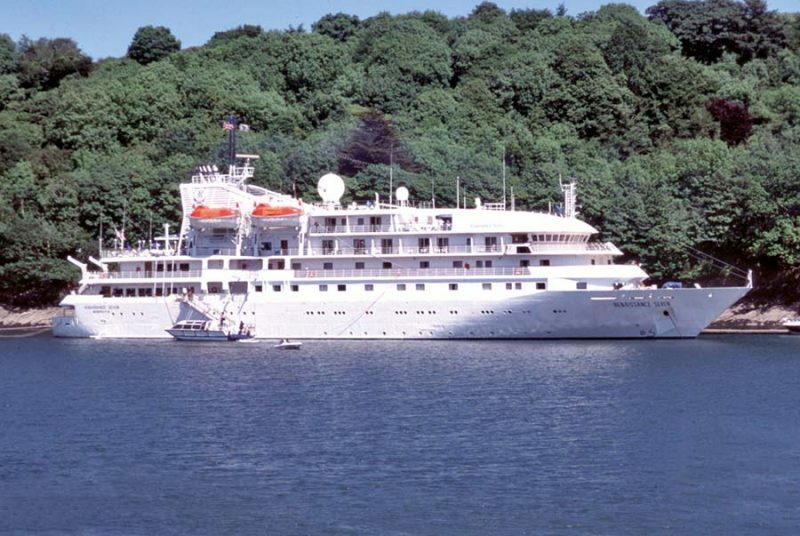 In 1998 she was sold to Malaysian owner Robert Tan and renamed The Neptune. The ship was then chartered to Universal Cruises and was briefly renamed The Neptune 2. She was refitted in Singapore from her luxury configuration to a more basic vessel carrying twice the number of passengers as originally designed. In 2005 Easycruises acquired her as EasyCruiseOne operating in the Western Mediterranean. This was a one-ship company started by the Easyjet founder Stelios Haji-Ioannou and intended to be a no frills cruise ship aimed at the younger market. The ship was painted in a similar bright orange livery to the Easyjet aircraft. 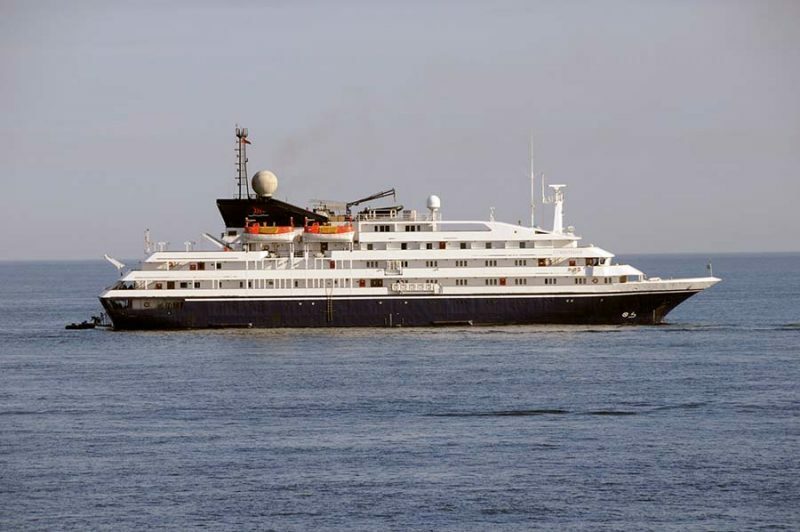 However the idea did not take off and in 2008 she passed to Platinum Yacht Management, Dubai and renamed Cruise One (above). She has been laid up at Jebel Ali, in Dubai for almost nine years, and appears to provide spares for her sister Dubawi (ex Renaissance). Yard Number 45 and entered service in 1990. 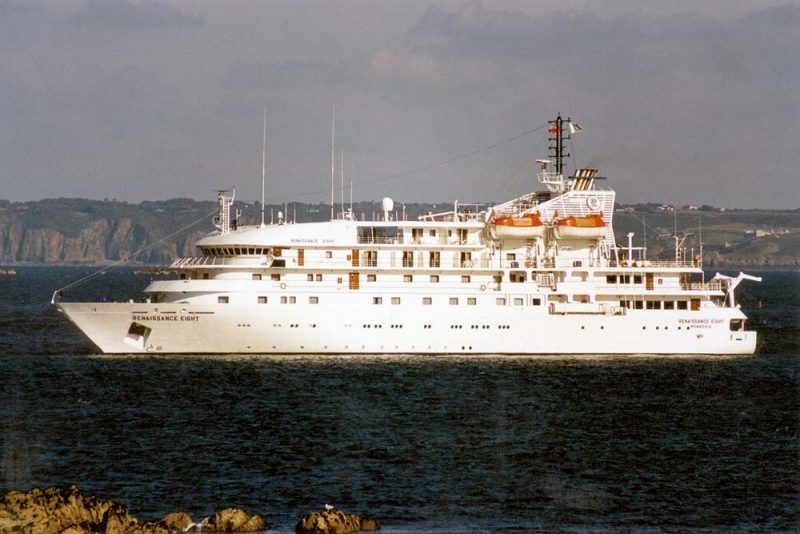 Purchased by Canodros in 1997 and renamed Galapagos Explorer II (above). Silversea Cruises acquired the company in 2012 and she entered service in 2013 being renamed Silver Galapagos (above). 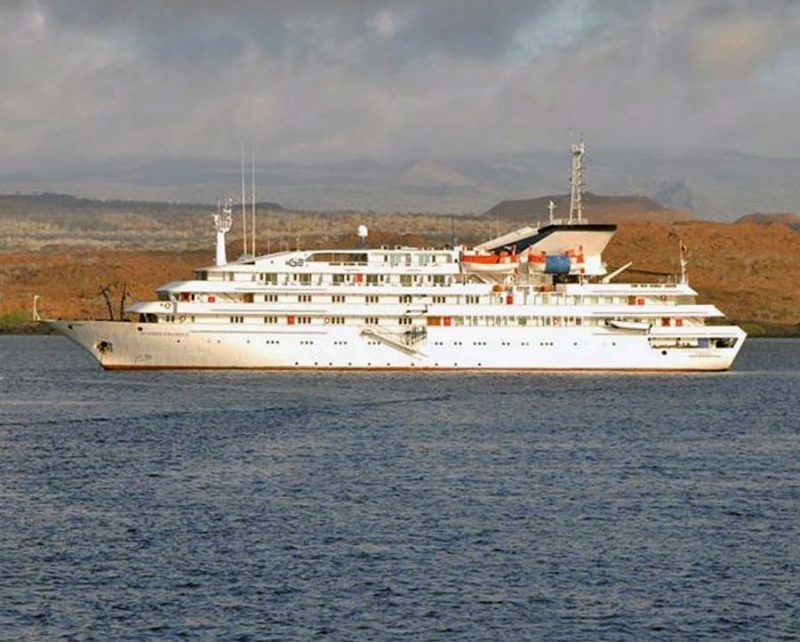 The ship currently provides luxury cruises to the Galapagos Islands from Quito in Ecuador. Yard Number 46 and entered service in 1990. 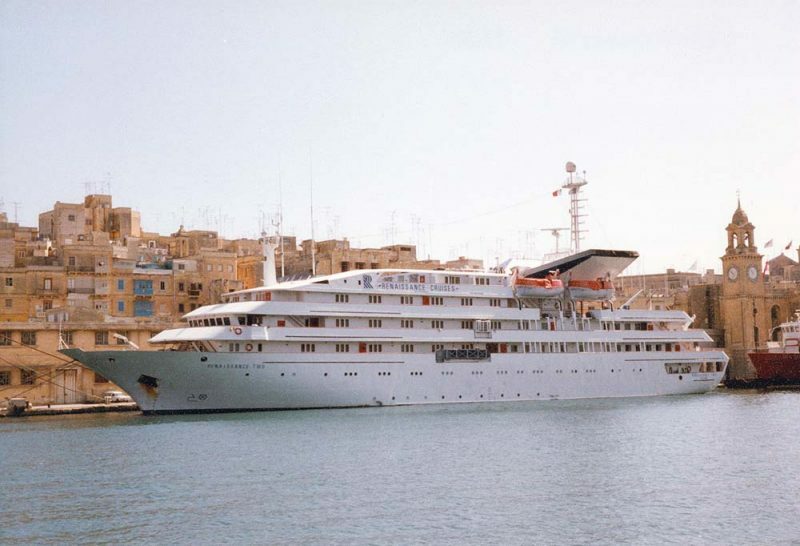 The ship was sold to Lindos Maritime in November 1996 being renamed Clelia II. The vessel was registered in the ownership of Goodwin Sands Marine and used as a private yacht. 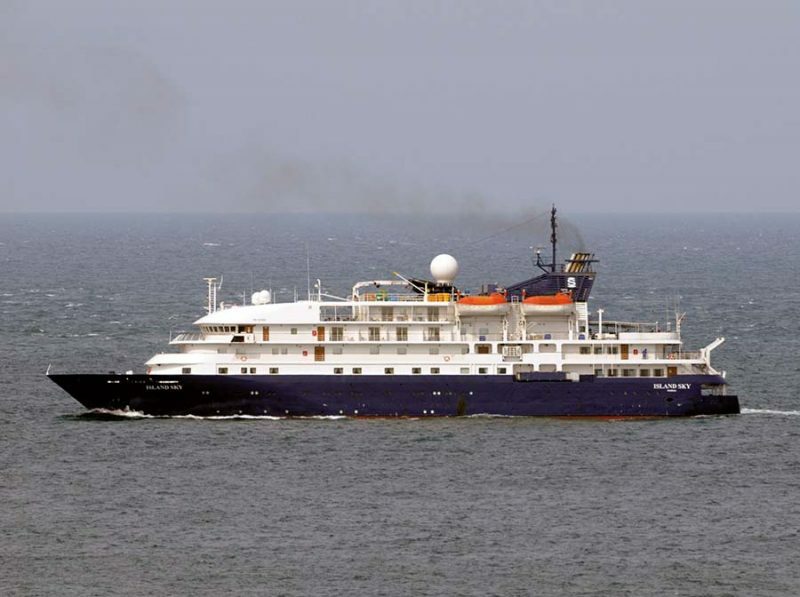 She was also operated by Travel Dynamics passing to Orion Cruises early in 2011 on a ten-year bare boat charter and renamed Orion II. Orion Cruises terminated the charter after only one year and she reverted back to Travel Dynamics before being acquired by Grand Circle Cruise Line and renamed Corinthian (above). Yard Number 1144 and entered service in 1991. She was renamed Hanseatic Renaissance in 1992 and back to Renaissance Five in 1997. The same year the ship was sold to a company named Sun Viva and renamed Sun Viva. Star Cruises acquired the company in 2000 and she became Megastar Sagittarius. 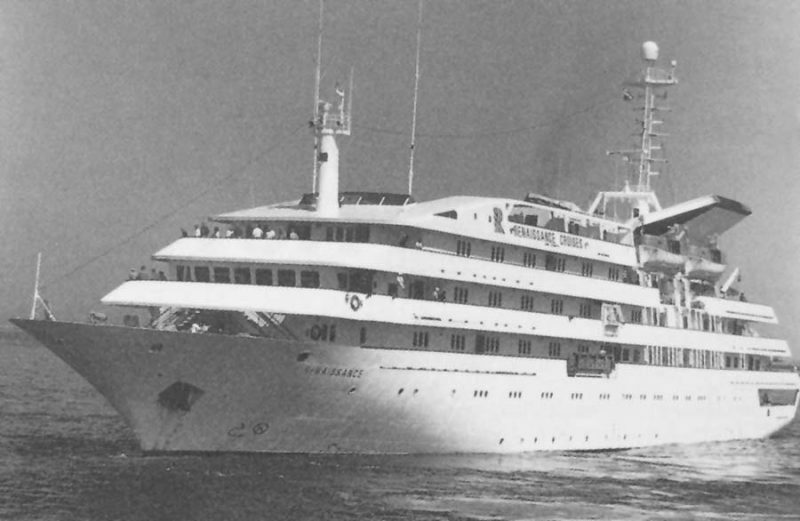 Only remaining with that company for a short time she was sold to Cruise West and renamed Spirit of Oceanus (above). 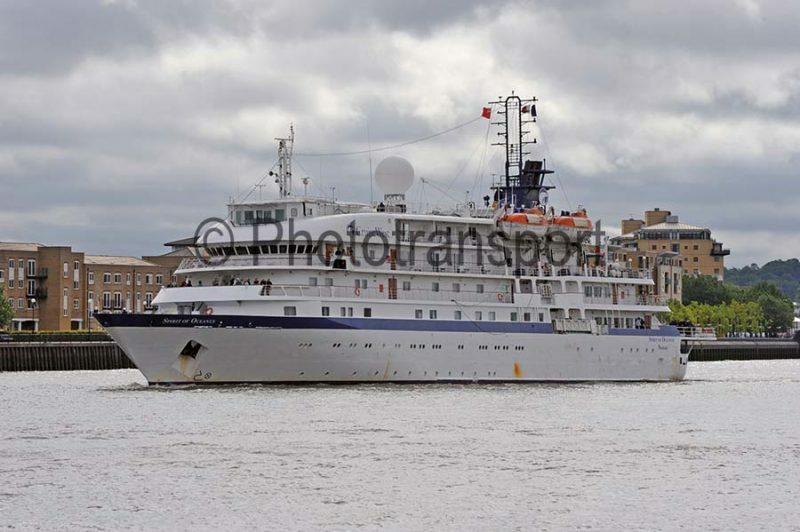 Sold once again, in 2010, to the Clipper Group, who chartered her to Quark Expeditions and renamed Sea Spirit (above). She is currently sailing in Antarctic waters for Poseidon Arctic Voyages. Yard Number 1145 and entered service in 1991. Sold to Sun Cruises of Singapore in 1998 and renamed Sun Viva 2. In 2000 the company was taken over by Star Cruises and she was renamed Megastar Capricorn. Hebridean Island Cruises bought the vessel in 2001 giving her a refit, which reduced the passenger numbers carried from 112 to 80. 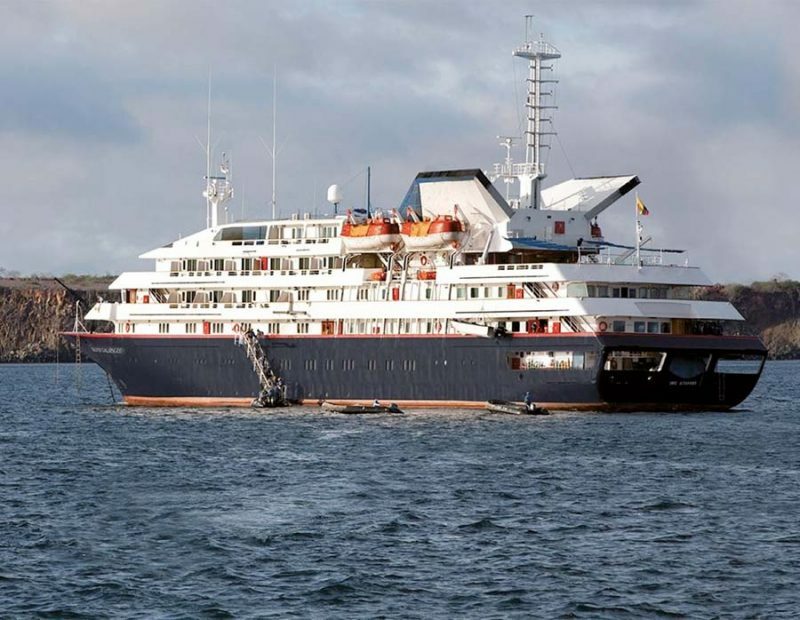 The ship was aimed at the ultra luxury market and renamed Hebridean Spirit (above). The vessel was sold in April 2009 shortly before the company went into administration. She was renamed Sunrise and used as a charter yacht. Noble Caledonia bought the ship in 2012 and she now sails as Caledonian Sky. Yard Number 1146 and entered service in 1991. She became Regina Renaissance in 1992 reverting to her original name in 1998. 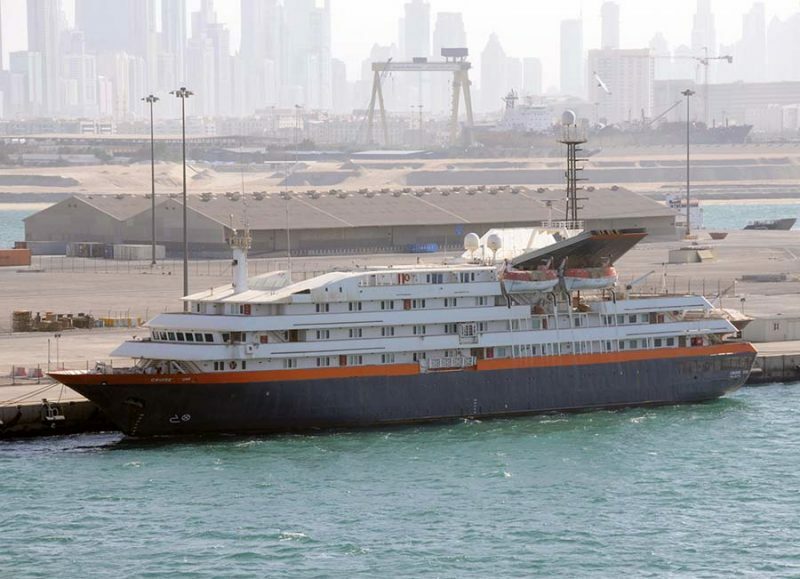 The ship was sold in 2001 and renamed Renai I, becoming Sun in 2003 and in 2004 Island Sun owned by Mauritius Cruises. 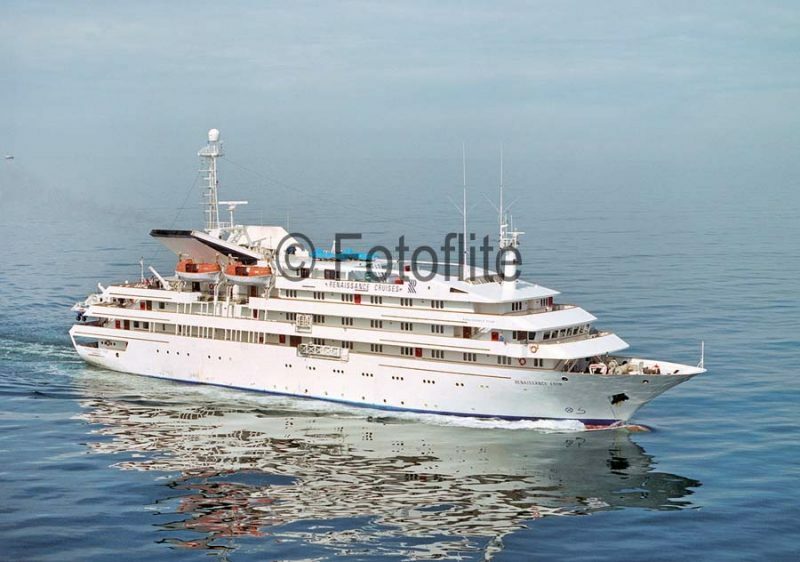 In 2005 she was bought by the Danish Clipper Group and renamed Corinthian II (above). After a refit in Greece the vessel was chartered to Travel Dynamics for service in the Mediterranean. 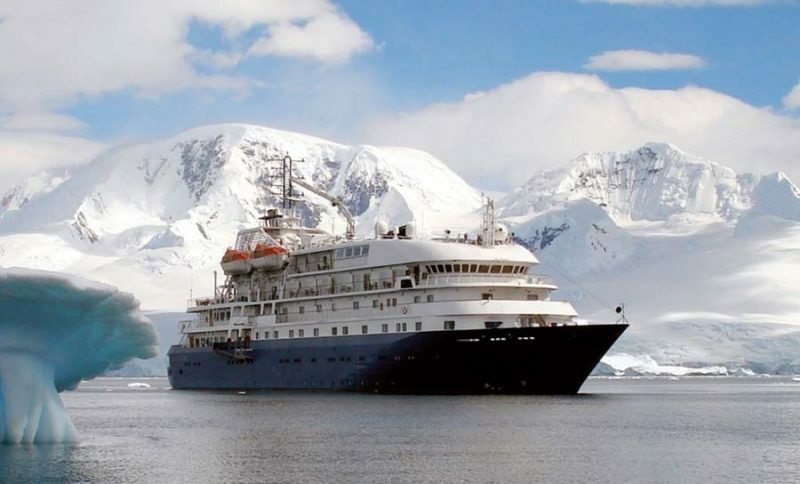 She passed back to the Clipper Group and renamed Sea Explorer (above) undertaking voyages for Quark Expeditions. 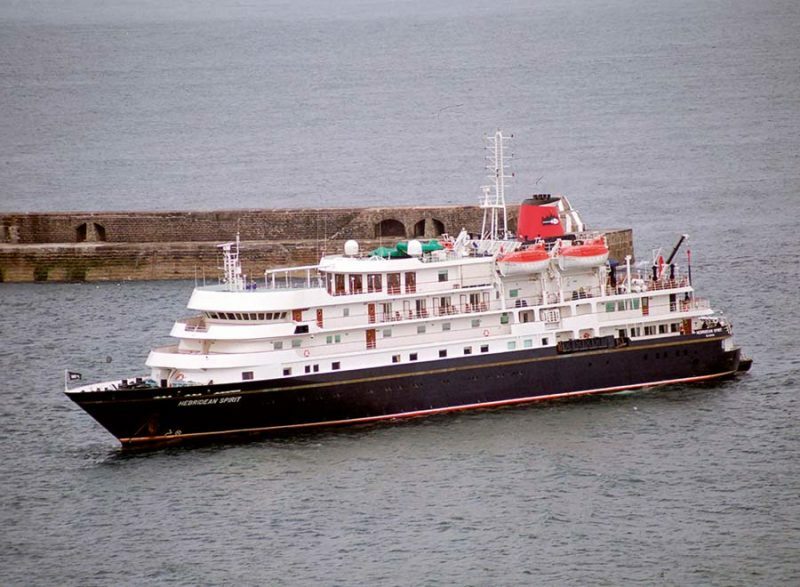 In January 2012 the vessel was chartered by Noble Caledonia and renamed Hebridean Sky. Yard Number 1147 and entered service in 1992. The vessel remained with Renaissance Cruises until the firm filed for bankruptcy in 2001. She was renamed Renai II and laid up. The ship was renamed Sky in 2003 and Island Sky in 2004 when Mauritius Island Cruises acquired her. When that company went out of business, the same year, she was bought by the Danish Clipper Group, to be immediately chartered by Noble Caledonia. In 2009 Island Sky (above) was purchased outright by them. The building of these ships was heavily subsidised by the Italian government to maintain employment at the shipyards. The ships were completed for $20 million each, about half of their actual cost. The first Gulf War hit the parent company hard, and the ambitious plans involving the cruise ships, and other cargo carrying tonnage had stretched the company’s finances severely and Fearnley and Eger filed for bankruptcy on the 16th September 1991. Following the liquation of Fearnley and Eger, Renaissance Cruises was taken over by Navigazione Alta Italia S.p.A, formed my the Cameli Group (Italy), Jorgen Jahre Shipping AS (Norway) and US Tour operators including Edward Rudner, who had also founded the Alamo Car Rental Company. 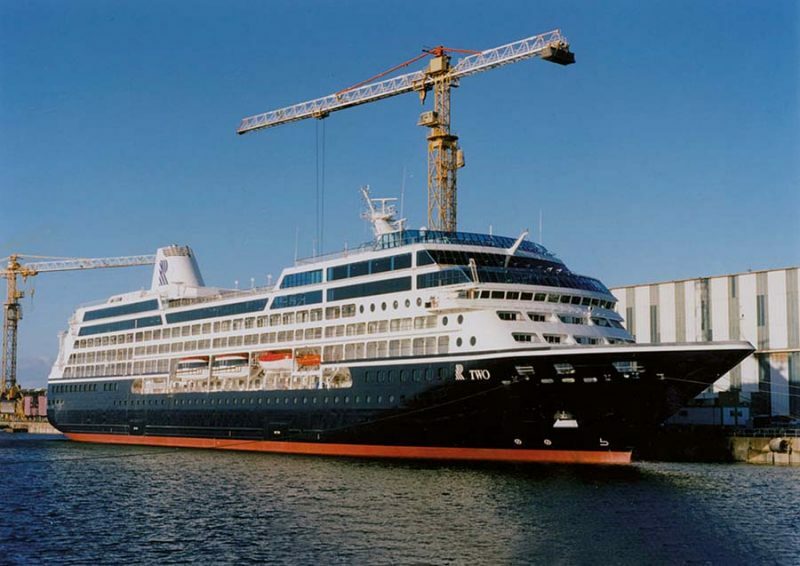 However in 1996, following the success of the smaller vessels in the luxury market an ambitious plan was made to order, eight 30,000gt cruise ships from the French yard, Chantiers de l’Atlantique, St. Nazaire. The shipyard, in effect, set up a production line in constructing these almost identical vessels. Beginning late 1996 the majority of the Renaissance Class yacht like vessels began to be either sold or charted out so that the company could introduce the new 30,000gt R Class ships. Before the firm went bankrupt in 2001 only two of the smaller ships were left in the company, Renaissance Seven and Renaissance Eight. All but one of the Renaissance Class vessels are still sailing, Renaissance Two being laid up in Dubai. The ships operate world wide, three operated for the luxury market by Noble Caledonia. The company angered travel agents by capping the commission received on bookings. Consequently a boycott was placed on the company, which still continued to develop and in 2000 carried 220,000 guests. These were excellent results for a company mainly carrying out is own reservations, however often at a dangerously low discounted rate. In April 2001 Malvern Marine acquired a stake in the firm injecting $300 million into its capital. The new ownership removed the commission cap paid to travel agents, who once again began to provide the company with passenger bookings. Without the travel agent bookings is was estimated that the company lost $95 million from sales of $580 million. Stabilizers: Two folding fins, extended 4.125m with an area of 9.9m2. The eight ships are each fitted with 2 lifeboats, 4 tenders and 2 rescue boats. Each ship cost £150 million to build. Although when built the vessels were practically identical and could carry a maximum of 824 passengers, as time progressed variations occurred after improvements were made, and passenger numbers varied. As an example Regatta (ex R Two) was extensively refurbished in 2014, and although it was not possible to alter the size of her cabins by moving partitions, the following is an example of the different cabin types and sizes. A total of 342 cabins, with 232 being fitted with a balcony. Owner’s Suites (6) 90m2. (Two each situated on decks 6, 7 and 8 at the stern of the ship, with views to the side and stern. Outside View and interior cabins 14.8m2 to 15.3m2. Two of the Azamara ships (Journey and Quest) had two additional lido suites added following modernisation early in 2016. All the ships were named with the prefix R followed by One to Eight. A naming system more akin to First World War Royal Navy submarines or Second World War German motor launches or minesweepers, but rather unimaginative for cruise ships. As they entered service, R one and R Two were allocated to the Mediterranean. R Three and R Four to French Polynesia, R Five, Europe, R Six to the Baltic, R Seven to the Caribbean and R Eight to South East Asia. However with the terrorist attack on the United States of 9th September 2001 there were mass cancellations by passengers and on the 25th September 2001 the company, which was already in poor financial condition, ceased trading. On that date all the ships at sea were ordered back to port and ‘arrested’ with the possibility that creditors would seize belongings of passengers left in cabins as assets. However, this did not happen, and passengers left their respective ships and returned home. Apart from R Three and R Four, in the Pacific, all the ships were initially laid up at Gibraltar and some later to Marseilles, whereas the two ships operating in French Polynesia were laid up locally. Following the collapse of Renaissance Cruses, Cruiseinvest Management S.A. was formed by the creditors, including the builders and the French Bank Credit Agricole. At an auction held in Gibraltar and Tilbury, the company was successful in bidding for the acquisition of six of the eight ships. These included R One, R Two, R Five, R Six, R Seven and R Eight. Later American Marine Advisors (AMA) a New York based investment bank, dedicated specifically to the maritime industry, was hired to eventually sell off the ships to recoup some of the cost. Technical management of the vessels was entrusted to Martinoli S.A.M. of Monaco, an international ship management company and technical project consultancy group with experience in the cruise and tanker shipping industry. This company also managed a number of the ships including R Five, R Six, R Seven and R Eight on short-term charters to other companies. Cruiseinvest Management SA was registered in the Marshall Islands as a company with an office in Paris to oversee the management of the newly purchased ships. 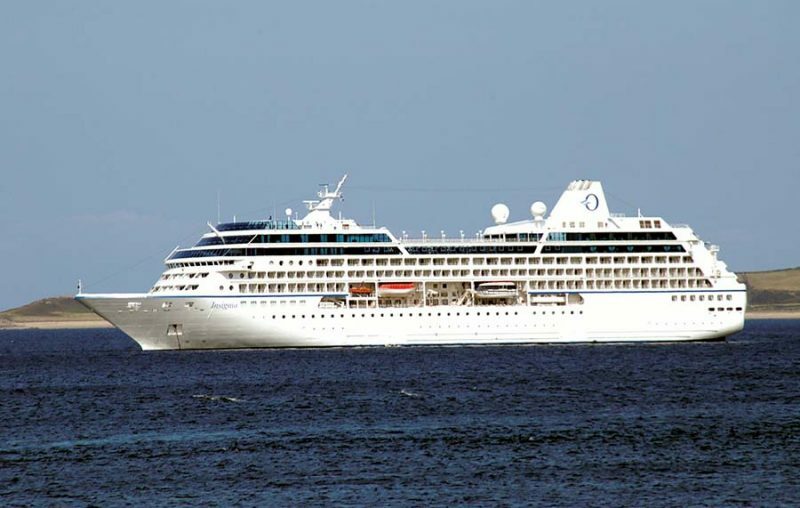 When the ships were sold there was a $100 million loss on the vessels sold to P & O/Princess which bought for $75 million dollars each and the newly formed Oceania Cruises paid $130 million for their newly acquired ships, substantially less than the new build cost. R One was the first of the class of eight ships to be built. Yard No H31, her keel was laid on the 26th June 1997 and she was launched on 24th January 1998 entering service on the 25th June 1998, being allocated to cruises in the Mediterranean. 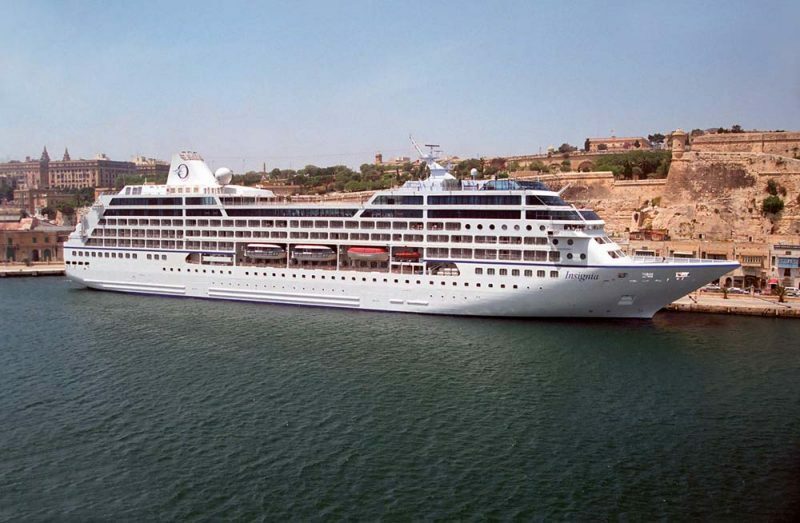 Following the collapse of the company on the 25th September 2001 she was laid up in Gibraltar until bought by Cruiseinvest and then chartered to Oceania Cruises entering their service in 2004. 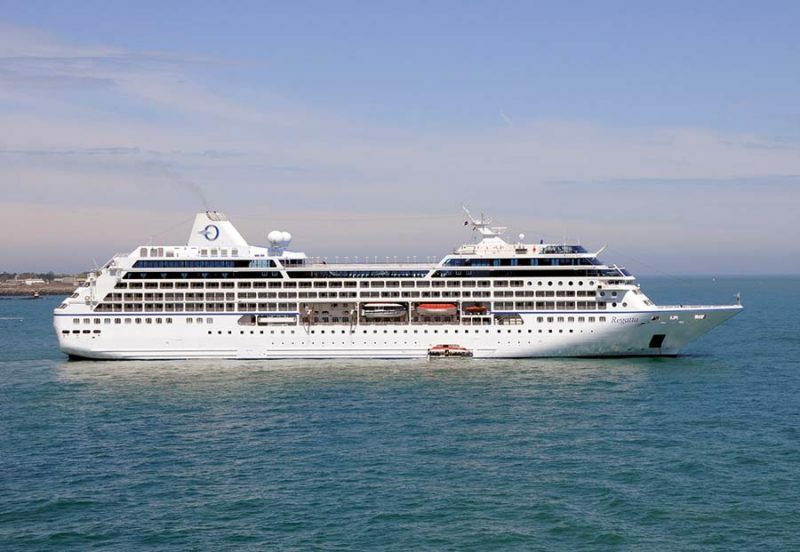 She was renamed Insignia (2) above and christened in Monte Carlo by Virginia Watters, wife of the founding chairman of Oceania Cruises, Joe Watters. 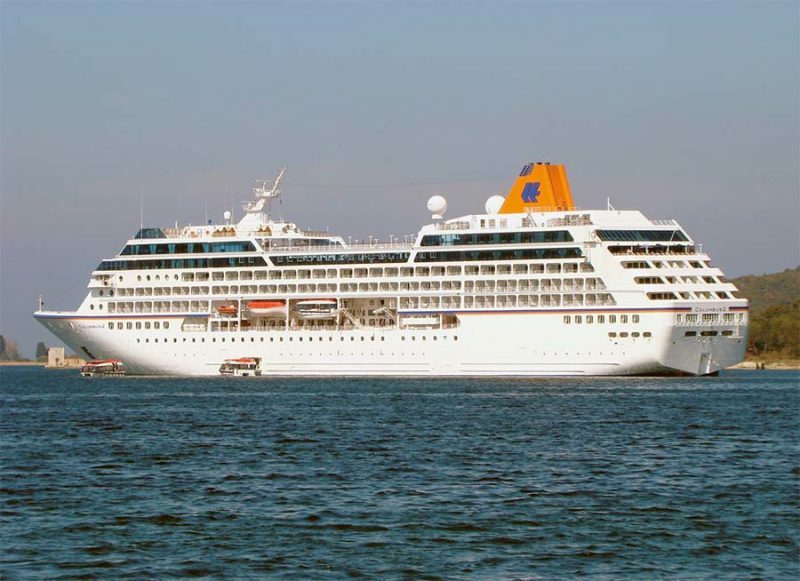 In 2006 Oceania purchased the ship, but in the spring of 2012 chartered her to Hapag Lloyd for two years, and during this time she was renamed Columbus 2 (above). In April 2014 the ship underwent a major refurbishment in Marseilles, before being returned to the Oceania fleet on the 31st May 2014 reverting to her original Oceania name. On the 7th December 2014 Insignia left Miami on a 10 day cruise to the Caribbean, and on the 11th December whilst in St. Lucia a major fire broke out in the engine room of the ship. Two Korean contract workers and one Filipino crewmember lost their lives. The cruise was terminated and 656 passengers were flown home. Following the completion of minor repairs the Insignia was towed to San Juan in Puerto Rico where full repairs were carried out. 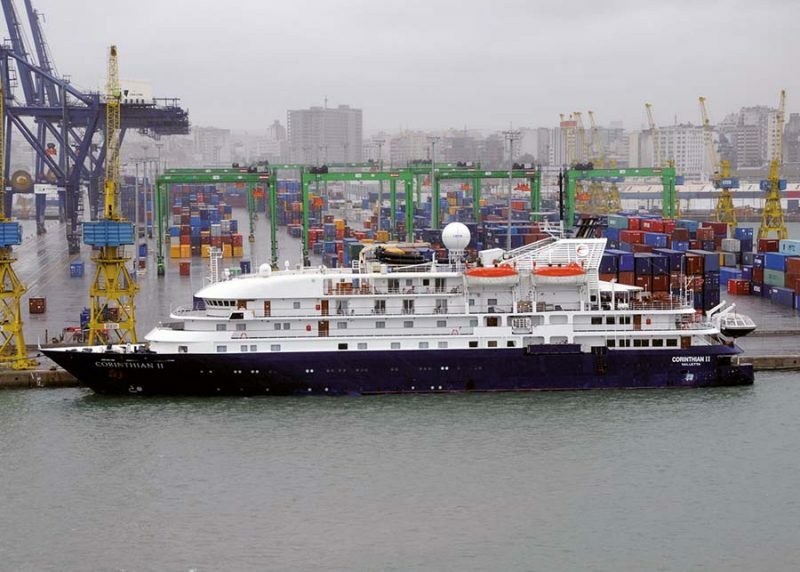 Insignia returned to service in March 2015 to start a world cruise from Singapore, which had been due to commence in Miami on the 10th January 2015 for 180 days. Leaving Singapore on the 10th March 2015 she began her amended voyage, the previous leg of which had been to sail from Cape Town, South Africa on the 15th February 2015 for 35 days. For the remainder of 2015 Insignia cruised world wide, including the United States/Canada, Atlantic Coast, Pacific, Mediterranean and Middle East. Insignia undertakes world cruises commencing in January each year, her next one is planned to sail from New York on the 11th January 2019. R Two (Yard No I31) was laid down on the 7th January 1998 and launched on the 22nd May 1998 being delivered to her owners on the 24th November 1998, commencing her cruising career in the Mediterranean. 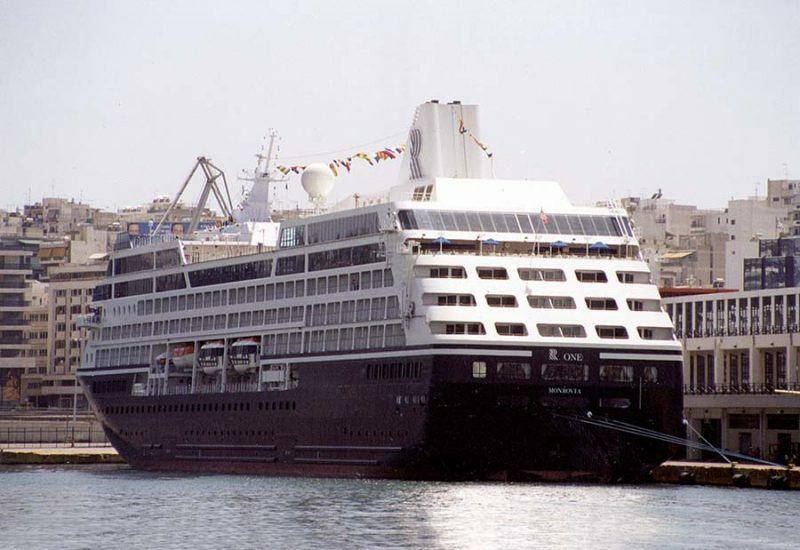 However after Renaissance went bankrupt on the 25th September 2001 the vessel was arrested and laid up at Gibraltar before being sold to Cruiseinvest and moved to Marseille, France where the vessel continued to remain idle. In October 2002 R Two was chartered to Oceania Cruises and given a $10 million refit. The ship was purchased out right in 2006. Upon entering service with Oceania she was renamed Insignia (1) above. 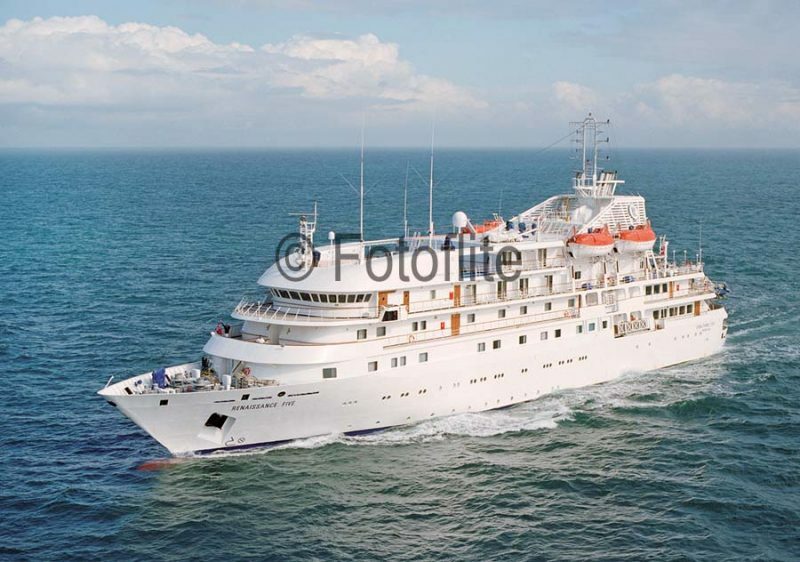 Between 19th April 2003 and 14th June 2003 the vessel was chartered to the French travel agency TMR who marketed the ship as the Vaisseau Renaissance, although her registered name remained unchanged. On the 15th June 2003 the ship returned to Oceania, but was renamed Regatta (above), the name Insignia having passed to her sister R One which entered service the following year. In May 2014 Regatta completed a $40 million refit at Vancouver when all cabins received major upgrades including new mattresses, carpets, furniture and bedding. A new specialist coffee shop was installed, similar to that already on-board the larger Oceania vessels, Marina and Riviera, plus more tables for two in the main dining room. Externally a miniature golf course, shuffleboard court and other deck games became additional features. 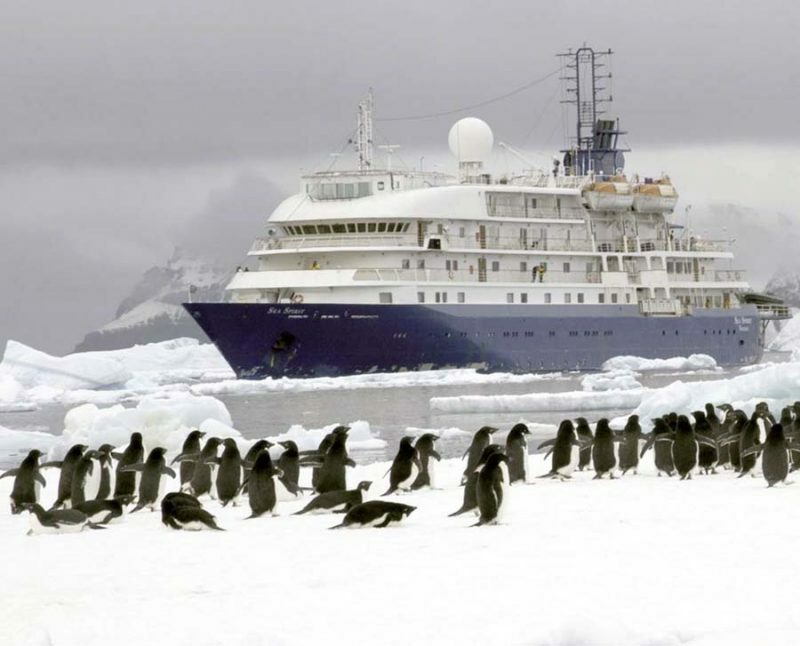 During 2018 the vessel is primarily cruising in the Pacific including Alaska.